Today, August 24, Ukraine celebrates the 26th anniversary of Independence. 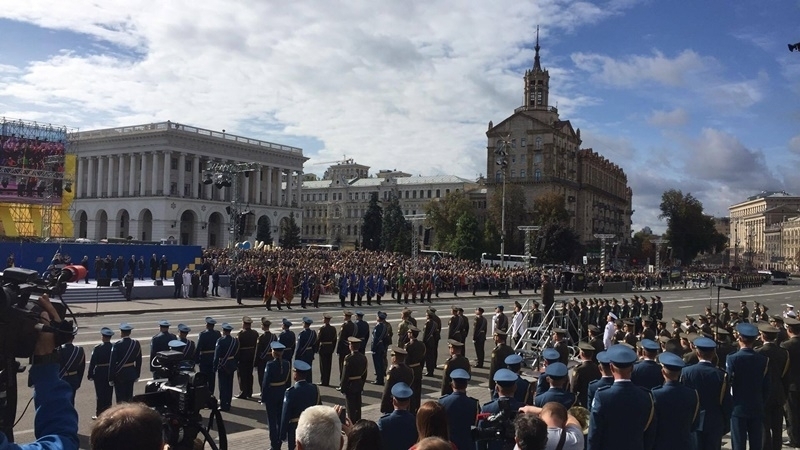 Military parade to the Independence Day began in the capital of Ukraine, Kyiv. 4,500 of personnel will march today along the main street of Kyiv, Khreshchatyk, of which a thousand took part in military operations in the East of Ukraine. In addition, 10 foreign units will join the parade, 9 of which will be represented by NATO countries, and 1 by Georgia. The parade is matching along Khreshchatyk Street, servicemen will walk along it from Bessarabskaya to the European Square. Military units of ten partner countries will be represented on the central street of Kyiv for the first time. Military units from the UK, Georgia, Canada, Lithuania, Moldova, Poland and the USA, as well as flag groups from Latvia, Romania and Estonia have already confirmed their participation in the parade. In general, 231 foreign servicemen will take part in the event. Besides, the defense ministers of the United States, Turkey, Georgia, Lithuania, Latvia, Moldova, Poland, Montenegro, Estonia, the Deputy Minister of Defense of Great Britain are present at the parade. 9:58 - The Commander-in-Chief of the Military Forces of Ukraine is expected to arrive. 10:00 - President Petro Poroshenko arrives at the parade. Military spiritual orchestra performs the hymn of Ukraine. 10:07 - Ukrainian Defense Minister checks the readiness of troops for the parade. 10:17 - The detour of the parade troops is completed. “Today is not an anniversary, but the 26th year of independence has become special. It was rich in significant events for us. In the 26th year of independence, we successfully completed the struggle for the ratification of the association agreement with the European Union. There is such a proverb "Dogs may bark but the caravan, our Ukrainian caravan, moves on." September 1, exactly one week later, the agreement comes into force and becomes our road map. At the 26th anniversary of independence, we raised the visa curtain. The agreement on association and visa liberation is what is the convincing evidence of our de facto and de jure break with the empire. With the one that Ronald Reagan called the Empire of Evil. At the 26th year of independence, we came out of deep shock, pain and we have no doubt that Ukraine will be successful. Today I signed a decree on awarding two more of our soldiers with the Orders of Heroes of Ukraine. They are 23-year-old Lieutenant Vasily Tarsyuk, and a Captain Eugene Loskot, who blew himself up to stop the Russian convoy. We bow our heads to the memory of the heroes who gave their lives. It is these days Ukraine also recalls the heroes of Ilovaisk battle. Eternal memory to the soldiers who perished in the battles for the will and independence of Ukraine. 10:30 - A minute of silence for the dead. We must give a firm response to the aggressor's attempts to go on the offensive. Nevertheless, we are moving away from the priority of the peaceful, diplomatic, political and legal way of the return of Donbas and the Crimea. 10:45 - After the speech, President of Ukraine Petro Poroshenko started a solemn state award ceremony. 10:54 - A solemn march of troops begins on Independence Square.